As of March 31, 2018, credit unions held $4.0 billion in private student loans. 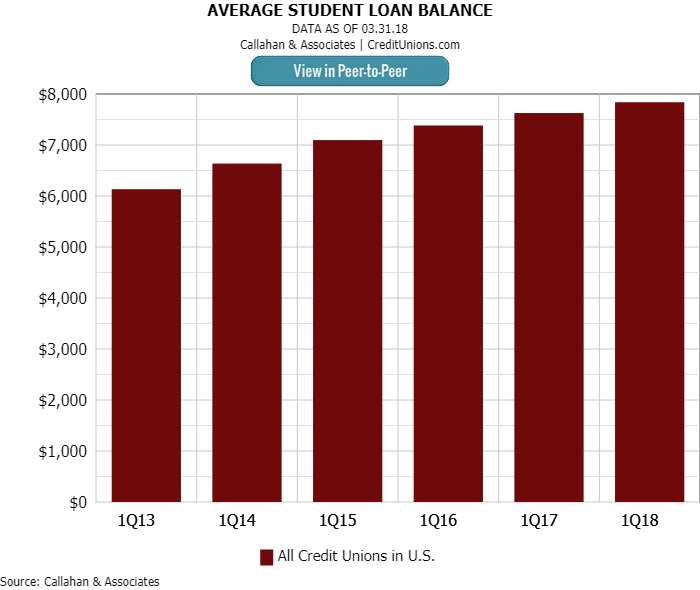 That’s up 14.0% from the first quarter of 2017. Credit unions are increasingly adding student loans to their portfolios as the movement works to provide affordable credit to young borrowers. According to the Federal Reserve, outstanding student loan debt in America reached $1.5 trillion in the first quarter of 2018. Student loan debt currently exceeds both credit card lending — at $977.0 billion — and auto loans — at $1.1 trillion. Answer the questions below to test your credit union student lending knowledge. Question 1: Private student loans makes up what percent of the credit union loan portfolio? 0.47%. Despite years of steady growth, private student loans comprise only 0.47% of the industry’s loan portfolio. For only credit unions that make such loans, the portion of the portfolio held by student loans jumps to 1.04%. Question 2: What percentage of credit unions held private student loans on their books as of first quarter 2018? 12.7%. Currently, 710 credit unions, or 12.7% of the industry, have student loans on the books. That’s up from 8.6% in the first quarter of 2013. Question 3: What is the average credit union private student loan balance? $7,885. There were 581,075 outstanding student loans held by credit unions as of March 31, 2018. The average balance of those loans was $7,885. According to a 2016 study by College Board, the average graduate of a non-profit university carries $28,400 in student loan debt. The number of credit unions offering student loans is growing. So is the average student loan amount. It takes minutes to compare various aspects of your lending portfolio to other credit unions with Peer-to-Peer. Let Callahan walk you through your numbers with a custom performance audit. Sign up now.